How to get from Fiumicino or Ciampino Airport to Rome? How do you get to Rome from Fiumicino or Ciampino Airport? A taxi to the center of Rome costs about 48 € (fixed price). The Leonardo Express: From the train station at the airport, this train travels to Termini station in 32 minutes (connection to both metro lines). The train runs every 15 minutes and costs only 14 € You reserve your ticket here or here. Shuttle bus to Termini station (connection to both metro lines). The journey takes 40 minutes and buses run every half an hour. The price is 11 € return and you can easily book this via this website. If you order the popular Rome City Pass, a one-way trip by shuttle bus is included. 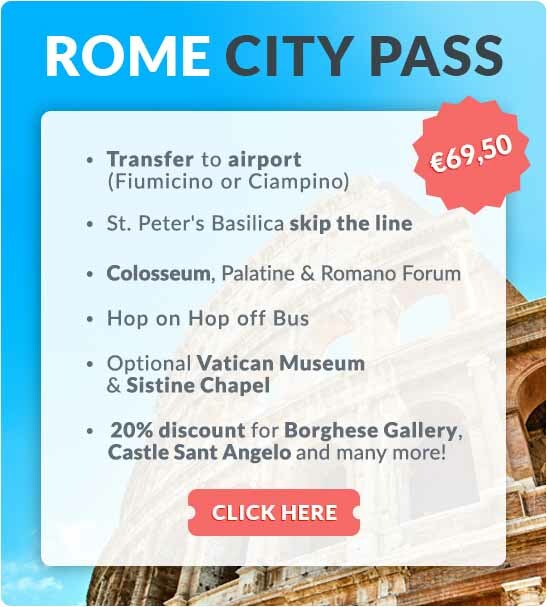 This Rome City Pass combines all the tickets you need for your stay in Rome, such as tickets for the Colosseum, the hop-on-hop-off bus, and skip-the-line tickets for St. Peter’s Basilica and for the Sistine Chapel if you are interested. One ticket will take care of everything for your city break. More info and reservations. A taxi to the center of Rome costs about 35 € (fixed price). Shuttle bus to Termini station (connection to both metro lines). The journey takes 40 minutes and buses run every half an hour. The price is 11 € return and you can easily book this via this or this website.